Auto-Tune corrects intonation and timing problems in vocals or solo instruments, without distortion or artifacts, while preserving all of the expressive nuance of the original performance - with audio quality so pristine that the only difference between what goes in and what comes out is the intonation and timing. All with a user-interface that is a model of clarity, speed and ease-of-use. For most common pitch problems, Auto-Tune 7's Automatic Mode instantaneously detects the pitch of the input, identifies the closest pitch in a user-specified scale (including minor, major, chromatic and 26 historical and microtonal scales), and corrects the input pitch to match the scale pitch. A Retune Speed control lets you match the retune rate to virtually any performance style as well as create the iconic Auto-Tune Vocal Effect (the Cher/T-Pain effect). - Time Tools Integrated time correction and manipulation: Auto-Tune 7's time control capabilities combine an extremely high-quality time shifting algorithm with an exceedingly intuitive user interface designed to make it quick and easy to correct timing errors or exercise your creative imagination. Auto-Tune 7's time manipulation functions include the ability to move a point in time within a selected range as well as move a range in time within a larger range. The time functions have their own Undo/Redo controls independent of the pitch correction controls and an Enable button that allows you to instantly switch between your original audio and your time shifted audio. - Evo Voice Processing Technology: In 2008, Auto-Tune Evo introduced Antares' seriously evolved Evo Voice Processing Technology, setting a new standard in pitch detection, pitch shifting, and formant processing performance. In the intervening years, Evo Voice Processing Technology has been integrated into Antares' full line of vocal processing tools. Now, with Auto-Tune 7, we are introducing the second generation of Evo Voice Processing Technology, offering even more natural (if you want it to be) pitch shifting and throat modeling over a wider transposition range. - Create target notes from MIDI in Graphical Mode: When tracking pitch in Graphical Mode, Auto-Tune 7 will record any MIDI note information routed to it (either from another MIDI track or live from a MIDI controller) and (optionally) display the data on the Pitch Graph Display. You can then use the new Make Notes From MIDI function to convert the MIDI information into Note Correction Objects. Perfect for fine-tuning the Auto-Tune Vocal Effect or even completely redefining melodies. 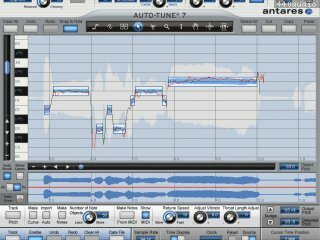 - Enhanced Graphical Mode Adjust Vibrato function: Auto-Tune 7's new Adjust Vibrato let's you modify the depth of any natural vibrato in the original performance. And since it is additive, acting on any already existing correction object, you are free to work on pitch correction and vibrato adjustment in any order desired. The new Flex-Tune feature allows you to set the rate at which Auto-Tune corrects pitch; giving singers unmatched freedom to exercise their vocal creativity while providing the seamless, natural pitch correction and audio quality for which Auto-Tune is renowned. 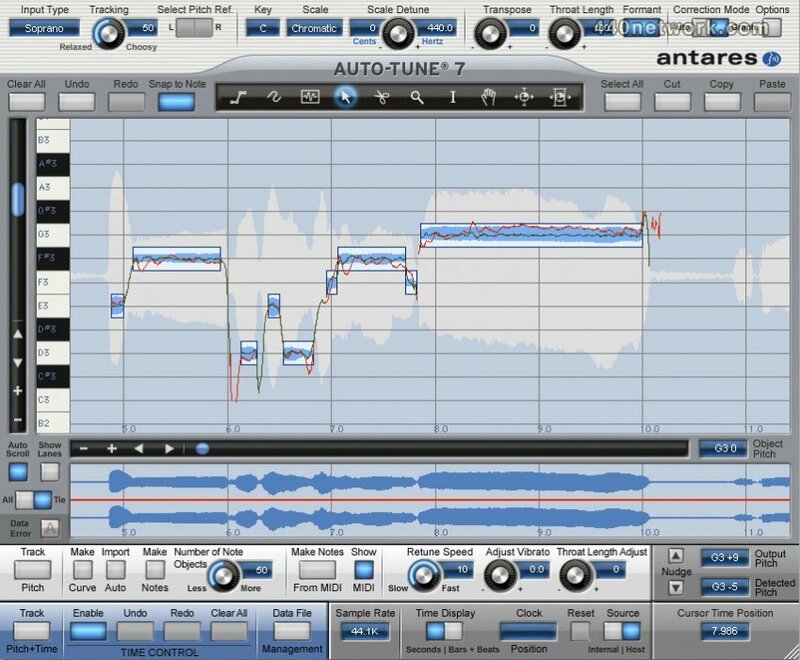 Auto-Tune 8 also features a new, ultra-low latency mode that provides real time correction for tracking and live performance, editing tools that are now active during playback and an even easier to use and a more customizable workflow designed to enhance your recording experience. Maintenance releases of Auto-Tune 7 VST for Mac and PC and Audio Units for Mac are now available. These releases squash a few minor bugs and are free updates for all current Auto-Tune 7 VST and Audio Units owners. This release fixed a session compatibility problem between 32-bit and 64-bit sessions that contained saved graphical correction objects.